In the previous article (https://guruparamparai.wordpress.com/2012/09/14/nanjiyar/) we discussed about nanjIyar. Now we will move on to the next AchAryan in the OrAN vazhi guru paramparai. Born as varadharAjan in nambUr, he became to be famously known as nampiLLai. 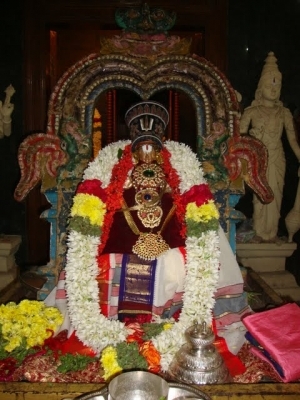 He is also known as thirukkalikanRi dhAsar, kalivairi dhAsar, lOkAchAryar, sUkthi mahArNavar, jagathAchAryar and ulagAsiriyar. As seen in periya thirumozhi 7.10.10, it is said that thirukkannamangai empeumAn wanted to learn the meanings of thirumangai AzhwAr’s pAsurams from kaliyan himself – so kaliyan took the avathAram of nampiLLai and emperumAn took the avathAram of periyavAchAn piLLai to learn all the meanings of the aruLicheyal. nanjIyar wanted to make a nice copy of his 9000padi vyAkyAnam. When he was enquiring in the srivaishnava gOshti, nambUr varadharAjar’s name was proposed. varadharAjar tells nanjIyar that he will write to the satisfaction of nanjIyar’s thiruvuLLam. nanjIyar first gives full kAlakshEpam of 9000 padi to varadharAjar and then gives the only original copy to him. varadharAjar decides to go across cauvery to his native place so that he can focus on the writing and finish it quickly. While crossing the river, suddenly floods appear and varadharAjar starts swimming across. While doing so, the original grantham slips away from his hands and he is devastated. After reaching his native place, he meditates on his AchAryan and the meanings given by him and starts re-writing 9000 padi vyAkyAnam. Since he was an expert in Tamizh language and literature, he adds nice meanings wherever applicable and finally returns back to nanjIyar and submits the same to him. nanjIyar seeing the vyAkyAnam, understands that there are some changes from the original, enquires what happened. varadharAjar explains the whole incident and nanjIyar is mighty pleased hearing the same. 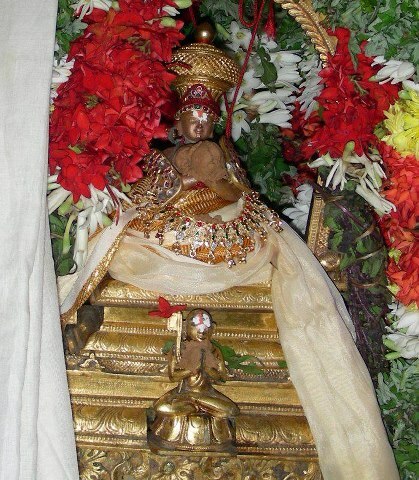 Truly understanding varadharAjar’s glories, nanjIyar names him “nampiLLai” and “thirukkalikanRi dhAsar”. 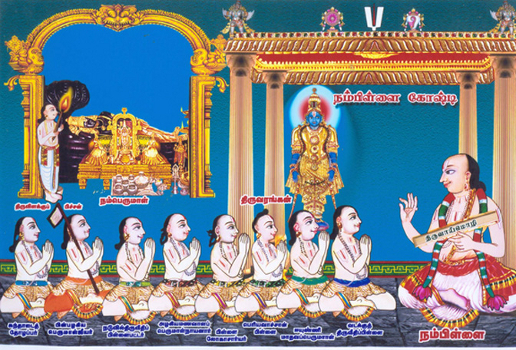 nampiLLai asks nanjIyar while there are so many pramANams for upAyAnthraram (karma, jnAna, bhakthi) why is there not many pramANams for sharaNAgathi. nanjIyar first replies that we dont need pramANam for what can be understood from prathyaksham – he says when a person is sinking in a river, he holds on or surrenders to another person who is not sinking – we are sinking in samsAram and emperumAn is not, so surrendering to emperumAn is the most apt upAyam. But he also identifies some pramANams subsequently from sAsthram to prove the validity of sharaNAgathi. He also says we cannot decide the validity of a process based on the number of pramANams being more or less – for example, in this world, there are many samsAris but few sannyAsis – it does not mean that because there are more samsAris, being samsAri is better. Hearing all these nampiLLai was very satisfied. nampiLLai asks nanjIyar “when will one understand that he has srivaishnavathvam?”. nanjIyar replies one who sees parathvam in archAvathAram, one who thinks about other srivaishnavas like his wife and children (have the same attachment towards srivaishnavas) and one who accepts other srivaishnavas insulting him happily can think that they have srivaishnavathvam. When nampiLLai was hearing sribhAshyam under nanjIyar, nanjIyar instructs nampiLLai to do thiruvArAdhanam for his emperumAn. nampiLLai says he does not know exactly how to do – at that time nanjIyar instructs nampiLLai to recite dvaya mahA manthram (interleaved with “sarva mangaLa vigrahAya” between the first and second part of dhyavam to indicate/appreciate emperumAn’s soulabhyam in being present everywhere in archAvirgraha form) and offer the bhOgam to emperumAn. This clearly shows that our pUrvAchAryas were fully dependant on dhvaya mahA manthram only for everything. nampiLLai asks “what is the purpose of avathArams of emperumAn?”. nanjIyar replies that “emperumAn took up big tasks to ensure that one who committed bhAgavatha apachAram is punished appropriately” (eg: as kannan empeumAn, he takes up so much pain on himself to ensure that duryOdhanan who committed many apachArams on his bhakthas gets killed eventually). nampiLLai then asks “what is bhAgavatha apAchAram?”. nanjIyar replies “it is to consider other srivaishnavas to be equal to ourselves”. He quotes many AzhwAr’s pAsurams where it says how great bhAgavathas are and based on those, we should always think that every bhAgavatha is higher than us irrespective of their birth, knowledge, etc. He also says that like AzhwArs and pUrvAchAryas we should also try to constantly glorify other bhAgavathas. nanjIyar explains to nampiLLai that for the ones who engage in bhagavath vishaya anubhavam, other lOka vishaya anubhavam like ishvaryam, artham, kAmam, etc are to be completely given up. He explains this using many AzhwAr’s pAsurams. He also quotes how thirumangai AzhwAr gave up attachment as soon as he realized the glories of emperumAn and started his prabhandam with “vAdhinEn vAdi…nArAyaNa ennum nAmam” (I sufferred at the hands of samsAram until I found emperumAn’s thirunAmam). Hearing this nampiLLai became very pleased and stays with nanjIyar for ever after that serving him continuously and hearing kAlakshEpams. nanjIyar performs thiruvAimozhi kAlakshEpam 100 times and nampiLLai conducts sadhAbhishEka mahOtsavam for nanjIyar. He also gains all the pUrvAchArya meanings from nanjIyar through these kAlakshEpams. nampiLLai had several unique qualities and his greatness cannot be measured. He had great command over tamizh/samskritham language and literature. In his lectures he was able to freely quote thirukkuraL, nannUl, kamba rAmAyaNam, etc and also from vEdhAntham, vishNu purANam, sri vAlmIkI rAmAyaNam, etc. He was also an expert in giving satisfactory reasoning using vAlmIkI rAmAyaNam whenever a doubt/question arises in the minds of people on any aspects of AzhwAr and aruLicheyal because vAlmIki rAmAyaNam was universally accepted by vaidhIhas. Let us see some of the incidents which show his greatness and his humility. nampiLLai regularly lectured at the eastern side (periya perumAL’s thiruvadi side) of the pradhakshiNam around the main sanctum at periya kOil. That is why even today we offer our praNamams there specifically after coming out of the sannidhi in that side. Once periya perumAL stood up and tried to watch nampiLLai’s upanyAsam. thiruviLakku pichan (a srivaishnava who took care of the lamps and lighting in the sannidhi) looked at periya perumAL in standing posture and pushed him down to his lying down posture saying that he cannot move in archAvathAram. emperumAn even broke his archA samAdhi to watch and listen to nampiLLai. nampiLLai’s lectures were so popular that often everyone will ask if this is namperumAL gOshti or nampiLLai gOshti. He was able to attract people to his lectures just like namperumAL was able to attract them for his purappAdu, etc. nampiLLai’s humility was unparallel. He lived like an example of srivaishnavathvam which he learned from nanjIyar. Once in front of namperumAL, kandhAdai thOzhappar (who comes in the lineage of mudhaliANdAn) says some harsh words towards nampiLLai. He was not able to appreciate the glories of nampiLLai and that came out as harsh words. nampiLLai did not say a word, accepting the insults silently left the temple to go to his thirumALigai. When thOzhappar went to his thirumALigai, his wife who already heard the news from others gave him strong advice on his behaviour and explained the glories of nampiLLai. She insists he should go and apologize at the lotus feet of nampiLLai. Finally he realized his mistake and decides to go to nampiLLai’s thirumALigai late in the night. When he opened the door to go, he noticed there was a person waiting there and that was none other than nampiLLai himself. nampiLLai seeing thOzhappar, immediately falls down and offering his praNAmams and says that he had committed some mistake which caused thOzhappar to be upset with him. thOzhappar was shocked to see nampiLLai’s greatness – even though it was thOzhappar who committed the mistake, nampiLLai was gracious enough to take up the fault on himself and apologise. thOzhappar immediately offered his praNAmams to nampiLLai and said from then on nampiLLai will be called “lOkAchAryar” because of his great humility. He said only some one with great humility even after being such a great personality can be called lOkAchAryar and nampiLLai fully fits that position. thOzhappar also gives up his hatred towards nampiLLai and starts serving nampiLLai with his wife and also learns all the meanings of sAsthram from him. mAmunigaL quotes this incident in his upadhEsa rathina mAlai and glorifies both thOzhappar and nampiLLai and from that itself we can understand nampiLLai’s purity. We can also understand thOzhappar became pure by associating with nampiLLai after this incident. naduvil thiruvIdhi piLLai bhattar who came in the thiruvamsam of bhattar seeing nampiLLai’s glories, developed some jealousy towards nampiLLai. Once when he was going to the king’s court, he invited pinbhazhagiya perumAL jIyar alog with him. The king invited both of them, gave them sambhAvanai and offered them nice seats. The king asked bhattar a question from sri rAmAyaNam. He asked when perumAl who declared he will not show his parathvam in rAmAvathAram, how did he say to jatAyu “gachcha lOkAn uththamAn” (go to the highest world – paramapadham)? When bhattar was not sure about the answer and worried about his reputation, the king gets diverted by some activities. bhattar asks jIyar how nampiLLai would have explained this and jIyar immediately says that he would explain it using “sathyEna lOkAn jayathi” (a truthful person will conquer the worlds). bhattar mediating on that slOkam realises the meaning and explains to the king that since rAman was fully truthful, he would simply use that quality to send anyone to any place with his power of honesty. The king being very pleased with the explanation, praised bhattar for his knowledge and presented him a huge wealth. bhattar immediately realising the power of one statement of nampiLLai, goes to nampiLLai and offers all the wealth to him. He also surrenders to nampiLLai and becomes a disciple of him and thereafter serves nampiLLai forever. Once when nampiLLai along with his sishyas was returning from thiruveLLarai on a boat, cauvery started flooding and the boat man mentions to the gOshti that some one should jump out to maintain the balance of the boat and save nampiLLai. Hearing this one old lady jumped out into the floods and nampiLLai became very sad. But when they reached the banks they heard the voice of the old lady from a near by island and she said nampiLLai appeared in front of her and saved her. The old lady shows how to serve AchAryan even at the cost of giving up our own life. And nampiLLai shows how to protect the sishyas even in dire situations. Once a srivaisnava lady living in the next door of nampiLLai was approached by a srivaishnavar and he said that since her house is right next to nampiLLai’s thirumALigai, if she gave her thirumALigai to nampiLLai that will allow nampiLLai’s thirumALgai can be extended and that will benefit a bigger srivaishnava gOshti. The lady first hesitates but then goes to nampiLLai and requests that he gives a place for her in paramapadham for her offering. nampiLLai happily writes a note for her and with that she leaves her charam sarIram a few days later and reaches paramapadham. nampiLLai had two wives. He once asked his first wife how she thinks of him. She replies that she considers nampiLLai to be an avathAram of emperumAn and treats her as his AchAryan. nampiLLai was very pleased and asks her to be engaged in thadhiArAdhana kainkaryam fully for the srivaishnavas who visit nampiLLai regularly. He then asks his second wife how she thinks of him. She replies that she considers nampiLLai as her dear husband. nampiLLai asks her to assist his first wife and asks the second wife to accept the prasAdham of the srivaishnavas. He says that taking srivaishnava sEsham will purify her and increase her level of nishtai to something spiritual (AchArya-sishyai) from her bodily views (Husband-Wife). When mahAbhAshya bhattar enquires nampiLLai what should be the thinking of a srivaishnava after realising his chaithanyam (knowledge). nampiLLai replies that such srivaishnavas should always think emperumAn is upAyam and upEyam, should be thankful for AchAryan who cured this time immemorial disease of samsAram, should think that emperumAnAr sidhAntham established through sribhAshyam as the truth, should do bhagavadh guNAnusandhAnam through sri rAmAyaNam and should spend our time fully in AzhwAr’s aruLicheyal. Finally he also says we should have firm faith that at the end of this very life we will see paramapadham. Some srivaishnavas from pandiya nAdu visits nampiLLai and asks him to give the essence of our sampradhAyam. nampiLLai instructs them to think of the sea shore. When they are puzzled and asks what to think about in a sea shore, nampiLLai explains that when chakkaravarthi thirumagan was staying in the sea shore before the war with rAvaNan, he was resting in his tent and the monkeys were watching around the area for protection. But out of fatigue when the monkeys fell asleep, emperumAn himself went around the place protecting them. nampiLLai explains that emperumAn is protecting us when we are sleeping so we should have full confidence in him that he will protect us even when we are awake and thus we should give up sva rakshanE sva anvayam (attitude of us trying to protect ourselves). We will see an excellent explanation given by nampiLLai on dhEvathAnthara bhajanam. One person came to nampiLLai and asks “you are worshipping dhEvathAntharams (like indhran, varuNan, agni, sUryan, etc) in your nithya karmAs but why not in their temples?”. nampiLLai gives an instant and brilliant reply that “Why do you worship agni in yagyam and stay away from agni frrom a burial ground? The same way, since sAsthram says nithya karmAs must be performed as bhagavadh ArAdhanam keeping that emperumAn is antharyAmi for all the dhEvathAs, we do it. The same sAsthram says we should not worship anyone but emperumAn so we dont go to other temples. Also, when these dhEvathAs are installed in a temple, they tend to develop rajO guNam and start thinking they themselves are supreme, and since we (srivaishnavas) are in sathva guNam we dont worship dhEvathAs who have rajO guNam”. Can this be any clearer than this for us to abstain from dhEvathAnthara bhajanam? One srivaishnava visits nampiLLai and says he looks leaner than before. nampiLLai replies when the AthmA grows the body automatically becomes lean. When another srivaishnava asks nampiLLai why he does not look strong, nampiLLai replies he has enough strength to worship emperumAn and he is not going for a war to be so strong. This proves that a srivaishnava need not worry too much about being very strong physically. When nampiLLai was ill, one srivaishnava is worried about that, nampiLLai says, we should think that any suffering is good, since according to sAsthram it is said that “the ones who have surrendered fully to emperumAn will wait for mruthyu dhEvan (death) happily to arrive”. At that time some srivaishnavas want to tie a rakshai for nampiLLai to relieve him from the illness out of their love towards nampiLLai and based on the instructions from engaLazhwAn, nampiLLai says he cannot accept that. The srivaishnavas question nampiLLai’s action and say “It is OK for a srivaishnava to not care for himself but what is wrong with them caring for other srivaishnava’s illness”. nampiLLai explains that if we try to cure our own illness, that means we have not properly understood our svarUpam that we are completely dependent on emperumAn and nothing else. And if we try to cure other’s illness that means we have not properly understood emperumAn’s jnAnam and shakthi, that again we should depend on him to cure his bhakthas. That was nampiLLai’s nishtai and he lived by that. Still we should understand that it is our duty to care for other srivaishnavas when they are suffering as did by mAranEri nambi when ALavandhAr was suffering. nampiLLai had great sishyas from many AchArya purusha families and his times in srirangam is glorified by everyone as nalladikkAlam (best times). His sishyas naduvil thiruvIdhi piLLai bhattar (125000 padi) and vadakku thiruvIdhi piLLai (eedu 36000 padi) both wrote commentaries for thiruvAimozhi but nampiLLai destroyed the former’s grantham because it was too large and detailed and took away latter’s grantham and gave it to eeyuNNi mAdhava perumAL so that it can be revealed by none other than azhagiya maNavALa mAmunigaL to everyone in the future. He also instructed periyavAchAn piLLai to write a commentary for thiruvAimozhi and periyavAchAn piLLai promptly fulfilled his AchAryan’s desire by writing 24000 padi vyAkyAnam which was praised by nampiLLai. When nampiLLai asks periya kOil vaLLalAr the meaning of “kulam tharum”, vaLLalAr says “when my kulam is changed from my birth kulam to nambUr kulam (kulam of nampiLLai), that means kulam tharum” – this is the same as periyAzhwArs srisUkthi pandai kulam (birth based kulam) to thonda kulam (AchArya sambandham and kainkaryamsrI). Such was nampiLLai’s greatness. Finally to conclude, let us see what periyavAchAn piLLAi has to say about nampiLLai in Ezhai Ethalan padhigam, Othu vAimaiyum pAsuram (periya thirumozhi 5.8.7). While explaining the terms “anthaNan oruvan” (unique scholar), periyavAchAn takes that opportunity to glorify his AchAryan and he says his AchAryan is the most unique scholar using the following words: “muRpada dhvayaththaik kEttu, ithihAsa purAnNanGgaLaiyum athigariththu, parapaksha prathkshEpaththukkudalAga NyAyamImAmsaikaLum athigariththu, pOthupOkkum aruLicheyalilEyAmpadi piLLaiyaippOlE athigarippikka vallavanaiyirE oruvan enbathu” (முற்பட த்வயத்தைக் கேட்டு, இதிஹாஸ புராணங்களையும் அதிகரித்து, பரபக்ஷ ப்ரத்க்ஷேபத்துக்குடலாக ந்யாயமீமாம்ஸைகளும் அதிகரித்து, போதுபோக்கும் அருளிசெயலிலேயாம்படி பிள்ளையைப்போலே அதிகரிப்பிக்க வல்லவனையிரே ஒருவன் என்பது). Simple translation: One who hears dhvayam first, then learns purANams and ithihAsams, leanrs Nyayam and mImAmsai to defeat bAhya/kudhrishtis and spends all his time in learning and teaching AzhwAr’s aruLicheyal and its meanings like nampiLLai can be said as a unique scholar. Here periyavAchAn piLLai compares sAndipani muni to be somewhat like nampiLLai (nampiLLai is far greater than sAndipani muni actually since nampiLLai was fully engaged in bhagavath vishayam as against sAndipani muni who asked kannan emperumAn to bring back his dead child even after knowing kannan emperumAn as mukundhan, one who can give mOksham). Because of his in-depth knowledge in various literature in both tamizh and samskritham he was able to mesmerize his audience during his lectures. It is also because of him thiruvAimozhi was propagated to new heights and aruLicheyal meanings were understood by everyone. For thiruvAimozhi, except for 6000 padi vyAkyAnam, all the other 4 vyAkyAnams has some connection with nampiLLai. 9000 padi even though originally was written by nanjIyar, it was re-written by nampiLLai with some special insights and meanings. 24000 padi was written by periyavAchAn piLLai based on nampiLLai’s teachings and instruction. 36000 padi was written by vadakku thiruvIdhi piLLai based on what was lectured by nampiLLai. 12000 padi was written by periyavAchAn piLLai’s sishya vAdhi kEsari azhagiya maNavALa jIyar and from the meanings presented we can easily understand that it closely follows nampiLLai’s 36000 padi. Not only that, nampiLLai out of his boundless mercy, laid the foundation for 2 glorious pillars of our sampradhAyam – piLLai lOkAchAriar and azhagiya maNavALa perumAL nAyanAr who gave us srivachana bhUshaNam and AchArya hrudhayam respectively based on the knowledge received from our pUrvAchAryas. We will see this charithram in our next article (vadakku thiruvIdhi piLLai vaibhavam). nampiLLai gives up his charama thirumEni in srirangam and attains parampadham. naduvil thiruvIdhi piLLai bhattar shaves his head fully on that occassion (sishyas and sons generally do that when the father/AchAryan leaves to paramapadham) and when his brother complains to namperumAL that even after being born in kUra kulam he did that, namperumAL summons bhattar in front of him and bhattar explains to namperumAL that he appreciates his sambandham with nampiLLai more than his family, namperumAL gets very pleased. Let us pray at the lotus feet of nampiLLai that we also develop such attachment towards emperumAn and AchAryan. In our next article, we will see vadakku thiruvIdhi piLLai vaibhavam. This entry was posted in OrAN vazhi guru paramparai and tagged bhattar, nanjeeyar on September 16, 2012 by sarathyt.